For Edith Wharton, life is an intellectual exercise. Her day-to-day existence consists mostly of writing and witty repartee . What she lacks is much of an emotional connection. She is fairly close to her governess-turned-secretary Anna, but other than that there is no one who truly holds claim to her feelings. Even Edith’s marriage holds little connection, emotional or physical; she and Teddy are more like cousins than spouses. It isn’t as though Edith feels she is missing anything, though. She has not had good experience with physical expressions of love in the past and has made her peace with it. Enter handsome American journalist Morton Fullerton. As Edith begins to lose herself with Morton, things between Edith and Anna grow incredibly tense. Anna has great fondness for Mr. Wharton and strongly disapproves of Edith breaking her marriage vows. The disagreement and Anna’s dislike of Morton drives a wedge between the two women who were once so close. Fields takes Edith’s life and immerses the reader in it. Drawn from actual letters and diary entries, The Age of Desire is much more about Wharton’s personal life and feeling than about her work, although some of her work is referenced. As such, it isn’t at all necessary that one has read Wharton’s work in order to enjoy the book. On the contrary, such an intimate portrait of Edith, her life, and her loves will make readers want to read her work so much more. Even readers who have no interest at all in Wharton will be able to find something that resonates in The Age of Desire. Fields writes in a very immediate and easily relate-able way about the Whartons’s dissatisfactory marriage, and the thrall of meeting someone who finally makes you feel truly alive. At the same time, this feeling is well-balanced by Anna’s believe in the sacredness of wedding vows and the concern she has for Edith. There are few readers who will not identify with the position of one or the other woman. 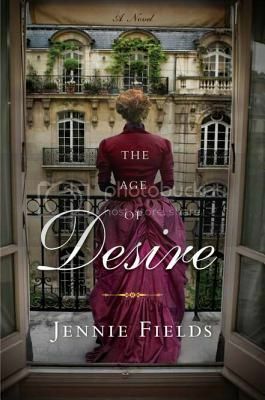 The Age of Desire is a fascinating portrait of Edith Wharton’s emotional life, as well as being a vivid picture of love, marriage, and friendship. I think I would have liked to have read a bit more about her work as part of this instead of about the affair-I really disapproved just like Anna and it made it hard to read. As a reader who often favors fiction based on the lives of authors over the works themselves, I’m definitely interested in this one! The cover is so lush. I’m excited to start it. This one has grown on me more as I have thought about it than when I was reading it. I haven’t read any of Wharton’s novels but I did enjoy reading about the author as a character. The audio production was very well done.